This website is mainly for YYC Workshops and Events. 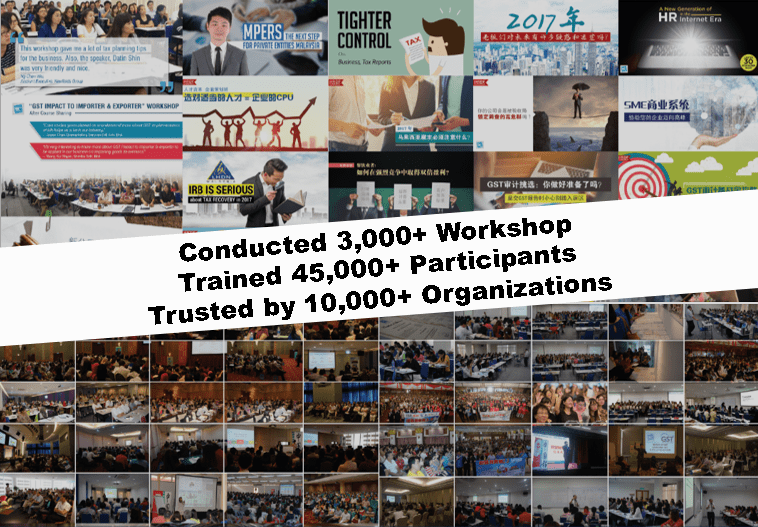 20,000+ participants trained! No. 1 Choice for SMEs in GST, Tax, Accounting and CEO training! Specialist speakers, complete course materials & case studies! Established since 1974, YYC – a leading Malaysian tax and audit firm has emerged as the one-stop solutions for businesses, committed in helping businesses in the areas of accounting, audit, tax, GST, business advisory and wealth advisory. YYC is the No. 1 Choice for SMEs in the area of Goods & Services Tax (GST), Tax, MPERS, Accounting Software, CEO training to organisations from the public and private sectors, big and small alike. Workshops and seminars conducted by YYC are designed and presented by specialists in their fields with a wealth of practical experience. Supported by comprehensive course materials, our courses incorporate case studies and practical exercises which help anchor the understanding of the course contents. The contents of our workshops are continually updated for legislative changes. Our participants come from different industries and different sizes, comprising of small-medium to large enterprises, multi-national corporations, public-listed companies and government agencies.